Is focusing easy? Of course not! It gets even worse when you are expected to focus on one thing only. But you know what? It is not impossible. In today’s article, we are going to teach you how to become a pro at the art of focusing. Also, we are going to give you some really cool tips and ideas on how focusing can become easy for you over a period of time. So why delay any further? 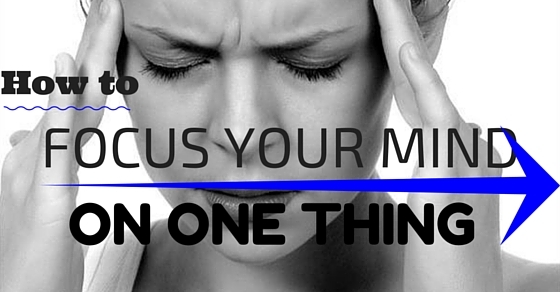 Go ahead and find out the ways to focus your mind on one thing. Want to stay focused on finishing that one important task assigned to you? Keep reading to find out how it’s done in the section below. There are times when we end up doing mindless work and then work on the tough tasks. To be honest, that is really not the way to be focused, especially if you want to focus on one thing at one time. Doing too many things at one go is not just draining but also reduces your focus significantly. When you are spending an hour in doing your work, you will have very less capacity. All the decisions that you make will tire your brain. To start focusing in an effective manner, you have to change the way you work. Do the difficult stuff first thing in the morning and then do the tough work. That will help you focus one thing at a time. And that is what we all want, don’t we? Secondly, you must know how to break your time. If you really want to focus on one thing, then it’s important that you spend time on that one thing. So, in this case, we would suggest that you don’t do it all at one go. Break whatever tasks you have for the day and then go on with it. You will be surprised seeing how well focused you were when the tasks were broken down properly. Try doing it today! When you are multitasking, your brain will begin to adapt fast and quick. Also, you will end up losing the ability to stay focused and become distracted very fast. Therefore, what you really need to do is train your mind to become focused just like you do with muscles. When you begin to practise concentration by getting rid of all distractions and focus your attention on one thing, you automatically begin to work on your tasks the right way. You should start with around five minutes per day and work the whole thing up to bigger chunks of time. In case your mind was just wandering, you can return to the task you already have at hand. When you are working or are trying to focus on one thing at one time, it could become a serious nuisance to stay focused. So in order to get rid of those loud noises and even louder distractions, we have come up with a very logical approach we bet will work for you. Using headphones or ear plugs while working is a wonderful solution to the problem. What you must remember is that distractions don’t always come from being loud. It could be someone unavoidable who is talking near you. So if you use headphones while working, you can automatically work better. Another thing you must always remember to do is go gadget free. Even though technology and gadgets have been designed to help us save a lot of time, there are times they actually consume too much of it and we end up doing nothing. For several of us, cell phones have surely become another appendage. And that could really be detrimental for those who are trying to become more focused. So what you really need to do is go completely gadget free. For those who are fast at forgetting stuff and have just started to become focused, here is something you should do. Keep reminders in the fridge or places where you usually visit so that you remember and know what tasks need to be done for the day. In that way, you will not be distracted and want to work at one thing only. Your mind will not wander off to other places. You will know that this is what you need to do and you will spend your day working things out for yourself. Now this is something that could really help you stay focused on one thing. If you keep a to-do list at home, you will never forget what really needs to be done. It will always be there at the back of your mind and you will constantly be in focus throughout the day. Since it is one thing that you are trying to focus on, having a to-do list could really help. You will be able to break all your tasks for the day and at the end of it, you will see how that one thing has been done. For example, if it’s a math homework, you could do five sums now and five sums later if you have a to-do list. That would help you know what must be done. When you are working somewhere that has no distractions, you will be able to work better and stay focused. There are times when it gets really tempting to think instead of just sitting in the living room with all of the roommates or family members but always remember that to stay focused, you must and always work in a place where you can really become attentive and focused. If you go by our suggestion, we would recommend you to work somewhere that is quiet. You have to consider the sound and wear headphones too. That will help you center your mind around work and get stuff done on time. Not all of the distractions in your life are going to be related to YouTube. Sometimes you are just sitting at home reading that one book for tomorrow’s class when suddenly your ex-pops up in your mind. And that’s it! If you understand your emotional distractions, make it a point to get rid of all of them so that you can stay focused on finishing that one thing. It is very common for us to feel different things at one go and if focusing was that, everyone would have done it. But since you have to work your way up, remember to remove all emotional distractions too. It is really all you need. Emotional distractions are literally the worst thing in today’s world. Get rid of them now! The more you simplify your life, the more chances you have off work being done. But we just don’t want to get the work done but also an essential one did at the same time. After all, in this article we are talking about how to focus on that one important thing and get it done fast and quick. There are so many of us who are busy doing tasks that are really not needed. We need to stop working on them and instead lay emphasis on that one thing that has to be done today. That is what is more important after all. Before you start your task, it is very important and essential to take some time off and simply meditate. From what we have learnt, meditation is a great way to get started. It will make your mind calm, declutter and remove all bad thoughts so that when you start work, you start on a fresh note. And that is what we all want, don’t we? Meditation always doesn’t have to be chanting mantras or sitting alone with your eyes closed. It could be something as simple as making yourself a warm cup of tea and drinking it on the porch as you see the sun rise. Go on a walk or just sit on the bench. Yes! It is never a good idea to just sit there in front of your computer for 10 hours. When you have a chance to break things out, go ahead and exercise. Do something physical and move around a little bit. Get up and go for a long walk even if you don’t have anywhere to go. It will seem a little corny but you can keep a few light hand weights in your office so that you can work out a little once a major section of the work has been completed. You can also have a healthy snack that will make you feel good. Fruits and nuts are a great choice for example. Yes! Stop going online if you want make most of the time you have. To stay focused on one thing, you have to be offline. Keep away your Buzzfeed, Facebook, Youtube and wikipedia miles away from you. Everything these days demands some digital attention. But to keep work on top and everything else behind, don’t stay online. The most simple and easy way to do is to shut down the WiFi connection entirely so that you won’t really have to log in or mess around. You can use blockers such as anti social, cold turkey and leech block that will help you stay away from the internet and stay focused on work the whole time. What it specializes in is blocking a few websites so that you can stay connected for some periods of time to work only. If you are struggling a lot, this may help. Whenever you are trying to get something done from the list, you must always remember to celebrate that one thing for just a minute. Even if all you give yourself is just one pat on the back, then you have to cross it off the list and just take one minute before you choose something to relax. You earned it after all! Also, you must use small celebrations for every day stuff. When you have completed the first project for that one day, cross it out and just pour yourself some wine and eat a cookie or something you like. You could also do something you really like doing. All of that works really well too. You should head out and eat at nice restaurants when you have recently got all the applications for graduate schools or maybe you have done something you didn’t know you could. Treating yourself in that way could really be great! This brings the post to an end. Always know that focusing your mind on one thing might not always be an easy task if you are someone who gets distracted fast and easy. However if you have read the post, then we bet you must have understood what you really need to do from now on. Focusing is hard but if you really try, you can do well and finish a lot of work within just one day. Also, if you have some interesting comments and ideas to give us, please do let us know in the comment box below. In case you have bigger questions in mind, don’t forget to drop them either. We would love to hear them as well. On that note, good luck and happy focusing! Next articleWhy are Recruitment Consultants So Annoying?